This year, Antala our Spain, Portugal, UK & Ireland representative is celebrating its 20th anniversary in speciality chemicals business. We have witnessed great worldwide changes and evolutions in technology, economic and social fields. Throughout the years, we have adapted to offer extensive technical support, providing the best solutions to meet and exceed the latest industry requirements. 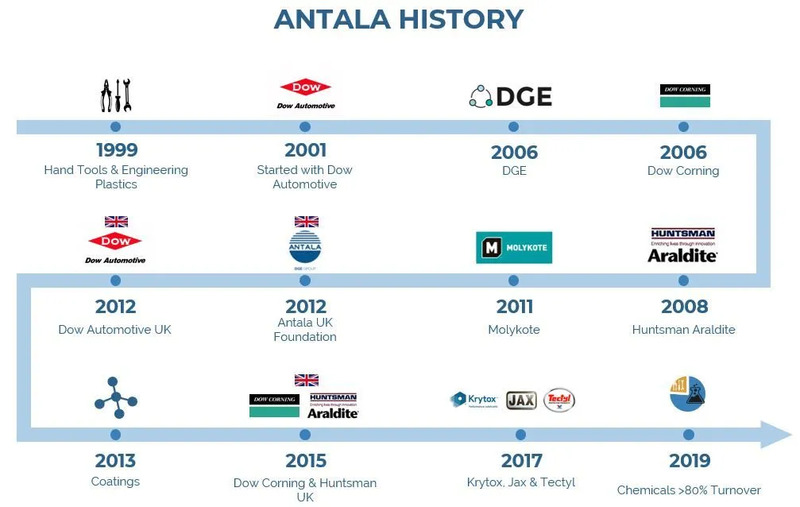 In 1999, Antala SL started the journey in the business world by distributing hand tools and engineering plastics in Barcelona. Four years later, thanks to our efforts in the automotive sector, we were selected as the sole distributor for Dow Automotive in Spain, Portugal and North Africa. At that time, the manufacturing industry was changing and demand for lightweight materials and composites was becoming evident across the construction, automotive, aerospace and rail industries. Whilst strategically positioned to support this revolution, we had recognised the advantages of bonding technology in assembly production. It was at this moment, we emerged as specialists in industrial adhesives and sealants. In 2006, the Dow Corning brand, now known as Dowsil had selected us as their distributor. In the same year, we became part of the DGE Group (Smart Specialty Chemicals) and in 2007, we signed a new distribution agreement with Huntsman Araldite. Once we were consolidated in the adhesives industry, we entered the world of lubrications becoming a distributor of the Molykote brand. In 2012, we opened our first industrial warehouse outside Spain. Antala UK was born and in the same year, we became an official distributor of Dow Automotive UK. Distribution agreements were also signed with Dowsil and Huntsman Araldite in the UK. Our portfolio grew to include Coatings and the industrial lubrication range was extended with the signing of Krytox and Jax. The Tectyl-Valvoline brand was added to provide customers with anti-corrosion solutions. Over the years, we have established ourselves as a technical company with strong knowledge and expertise across a wide range of industries and applications, from encapsulating adhesives for new generation electronic devices, to lubricants that maintain the functioning of large nuclear power plants. Antala, is committed to providing the best solution to help you remain at the forefront of your industry.